This story begins in a Tokyo steakhouse. Which is to say a steakhouse, except there are no chairs. Everyone is standing side-by-side at a counter, silently cutting up soy-glazed strips of beef. The name of the restaurant ‘Ikinari Steak’, roughly translates to ‘instant steak’ or ‘steak all of a sudden’. My uncle has brought me to this fast-food steak outlet to cater to my Australian tastes. I tell him why I’m in Tokyo. I meet Michito Sakaki at Kawaguchi station, forty-five minutes out of Shinjuku. Michito is the 34-year-old captain of the Japanese national AFL team. He started in university, a teenager recruited by the enthusiastic members of the AFL Club during orientation week. Modern AFL in Japan owes itself to two exhibition games played in Tokyo some thirty years ago. Hawthorn played Carlton and Essendon on two tours of Japan, arousing curiosity amongst local youth. My vocabulary may be limited, but I never needed to learn the Japanese phrase for ‘niche’. The Japanese covet the unique and fetishise the obscure. Soon after the Hawthorn games, AFL clubs emerged in local universities. 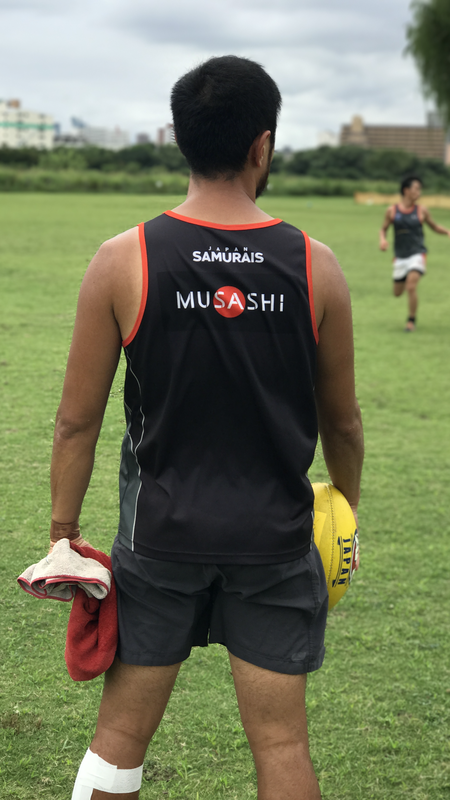 The product of one university team, Michito has now played AFL for over fifteen years in Tokyo’s local league. In two weeks, he will captain Japan in his sixth International Cup. Largely self-taught, Michito streams three games of football a week online to study the game. This is a recent innovation. In previous years, he has relied on satellite feeds of Australian television. Michito has invited me to training as the Japanese prepare for their impending trip to Melbourne. We arrive at the pitch early and wait for social games of rugby to wrap up. All training sessions have been with rugby fields and posts. Many players will play on an AFL ground for the first time in the Melbourne tournament. The local cricket oval here in Tokyo is off-limits to football boots. As the rest of the Team Japan filters in to begin their warm-up on the sidelines, I notice the obvious. I try to approach this tactfully. “Michito, how tall is your ruckman?” I ask. ”180 centimetres,” he says. This makes me, the journalist, marginally taller than every ruck and key-position player. After drills, the team engages in match simulation.The Japanese have adopted a unique gameplan built around their physical distinctiveness. They play a virtually uncontested style, taking advantage of their speed and aerobic endurance to spread across the ground. Michito calls for switch-heavy transitions from defence to attack, no doubt influenced by modern passages of play. Footskills are admittedly impressive, but there is minimal use of handball and even less tackling. All this uncontested kicking and spacing around the field is not unfamiliar. It recalls the possession-heavy strategies seen in soccer. I ask Michito if this is how AFL is played in Japan, a mutated version of the world game. “The Japanese don’t usually like contact sports,” he says. The ones that do have presumably drifted to Rugby or martial arts. Most players on the Team Japan are converts from soccer. As they train, the Japanese are vocal and animated. “Switch!”, someone yells. “Nice kick!” is called and echoed. Squadrons of similarly sized players make their way from end to end, always kicking and marking. I wonder if this uncontested style will hold up against bigger, more aggressive opposition. There is every possibility that Team Japan is in for a bruising. The players will fly down to Melbourne in two weeks, paying for their own flights and accommodation. The three-yearly International Cup will be a unique opportunity to represent their country in sport. This is perhaps the main reason why many have adopted AFL in the first place. I am cautiously optimistic about their chances. Before I leave, I am presented by Michito to a circle of thunderous applause. I ask him what this is about. They are thanking me for my coverage of the team. Three weeks later, I meet Michito and the rest of the team in Melbourne at the Collingwood-Geelong game, a day after a fourth place finish in their division. They have fared well in the tournament, three straight wins against India, Pakistan and Germany before being knocked out in the semi-finals by a larger and more physical Croatia. Michito is still wincing from the third-fourth decider against China yesterday. “We got roughed up by Germany and Croatia. We had more skill than China, but they had more intensity,” he said. I press him for more, but there is none. I decide to leave it. Michito has decided to focus on Collingwood and wing-forward Will Hoskin-Elliott. It’s easy to see why. Hoskin-Elliott is thin, quick and athletic. He plays the Japanese style of AFL. He scores two quick goals today and Collingwood are off to a fast start. “HOSKIN-ELLIOTT!! !” Michito screams after the second goal, punching his fist into the air. Aerobic, uncontested and damaging. This is the Japanese brand of AFL and the Australians are playing it too.